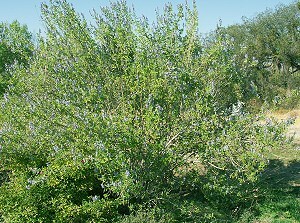 The stately Grape Scented Sage in the photo on the left is about 8 feet tall and 6 feet wide. It was planted about five years ago. 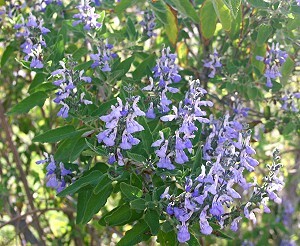 It has both fragrant foliage and flowers. The sweet freesia like scent of the flowers is a welcome addition to the autumn garden. Both leaves and flowers can be used to make tea. The softly colored flowers can also be used as a garnish. A late blooming plant that is particularly loved by hummingbirds, Grape Scented Sage complements the fall blooming Lion's Tail and Lemon Verbena. Dark green Lemon Thyme makes a fragrant under planting for Grape Scented Sage and helps to hide the open branching at the base of the plant. Grape Scented Sage is one of the six plants chosen to be in our Zone 5-11 Tea Herb Garden Six-Pack and makes a nice addition to our Zone 8-11 Fragrant Herb Garden Six-Pack.